Professional Coin Grading Service (PCGS) graded an extraordinary Lincoln Cent that was recently sold in a private sale for over one million dollars. 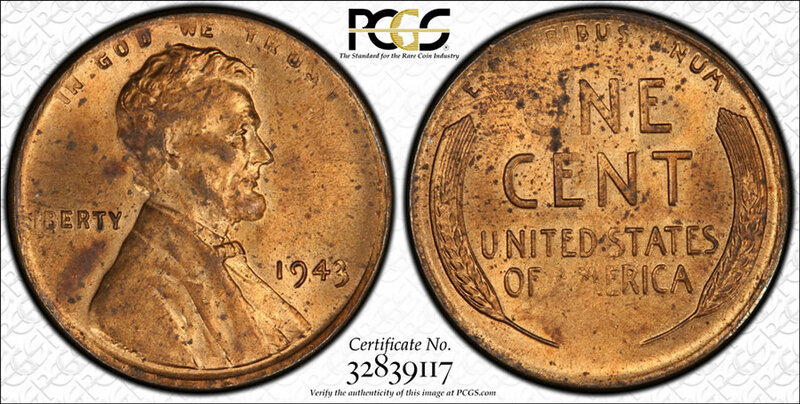 The bronze 1943 Lincoln Cent is the single finest known, with a grade of PCGS Mint State 63 Red. It will be on display at ANA’s Money Museum and again at the 2018 ANA World’s Fair of Money in Philadelphia, PA from Aug. 14 to 18, 2018. "It’s always exciting when there’s another million-dollar coin sale," said Mike Sherman, Director of Education for PCGS. "It proves the rarity and value collectors place in these uncommon Mint Errors. This piece in particular is a beautiful example of a very rare and valuable coin." In 1943, all three U.S. Mint branches produced hundreds of millions of Lincoln Wheat Cents in silver-colored zinc-coated steel to conserve copper for other uses during World War II. The U.S. Mint that year accidentally produced a total of 15 bronze cents, making this an extremely rare numismatic treasure. The opposite mistake was made in 1944, when the mint accidentally produced some steel cents using leftover plachets from the previous year. 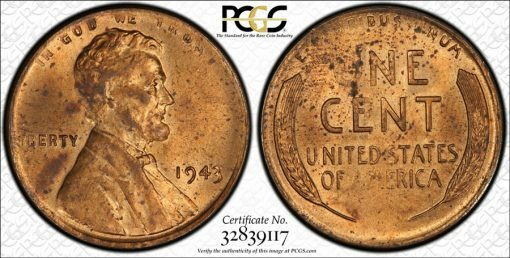 Novice collectors often get this information confused, believing that their steel 1943 Lincoln Cent or their copper 1944 Lincoln Cent is valuable. These coins are common in average circulated grades, and only in pristine mint state are they collectible. Since its founding in 1986, PCGS experts have certified over 38 million coins with a total market value of over $32 billion. For information about PCGS products and services, including how to submit your coins for authentication and grading, visit www.PCGS.com or call PCGS Customer Service at (800) 447-8848. PCGS is a division of Collectors Universe (NASDAQ: CLCT). What a treasure to own. If the owner gets bored of it, I’ll gladly pay them double what it’s worth. Doesn’t look like MS63 to me. Weak strike with spots all over it. Maybe MS60 brown/red. A MS 63? With so many letters missing? The O in one is less than 50%. And what about the stains?